My friend and I arrived at Grace on a Wednesday night with a 6pm reservation. The restaurant was just starting to get filled up so it was nice and quiet. We were seated at a table that was a little dark. We asked to sit at brighter table and it wasn't a problem at all. They generously gave us a four-top near a lamp even though we were only two. It is a beautiful restaurant--elegant, not too modern, not trying too hard, yet not old and stuffy. As the night progressed, the restaurant quickly filled up. Our server was warm and welcoming. We were offered complementary sparking or still water. I LOVE sparkling water. I don't usually order it because I feel like a bottle of Pellegrino is unnecessarily expensive. I think I almost yelled "sparkling!" at the waiter in my excitement. The night was off to the good start. We were given some bread that others have complained about being too hard. I liked it. It was a nice ciabatta, with a nice airy yet chewy center and crunchy crust. We started to study the menu. 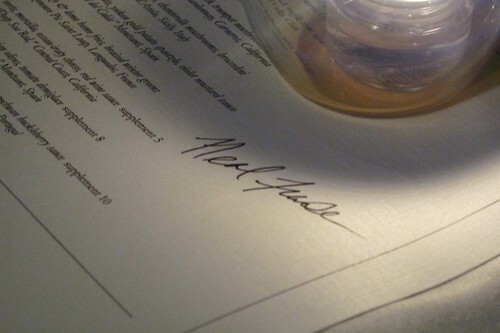 It wasn't short and boring like most of the DineLA menus. It was so extensive with so many choices I was almost overwhelmed. There were so many things I wanted to try. 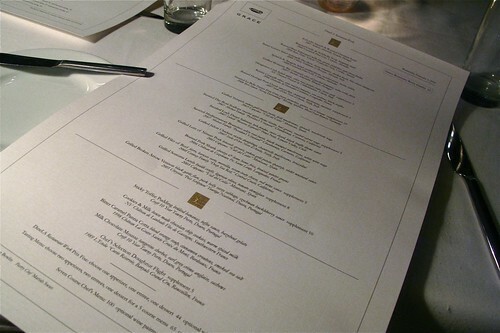 The DineLA dinner was $44 and some of the choices came with a supplementary charge. No problem. It makes sense that foie gras would be more expensive than a squash soup. All the supplements that we added on were well worth the money. I am not one to usually order grilled calamari when I see it on a menu so I'm so glad my friend decided to order it. The dish had beautiful colors. 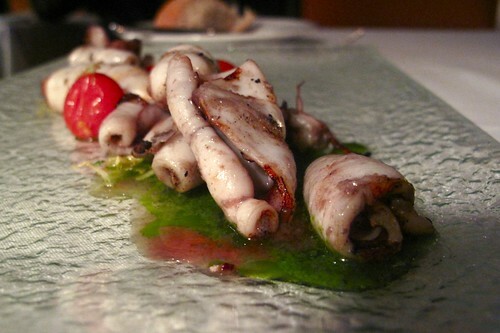 The texture of the calamari was delightful--not at all rubbery as some might expect calamari to be. Each piece of the wonderfully fresh calamari was sweet and had a nice smokey, grilled flavor. This was my appetizer choice. I usually cannot pass up housemade pasta. 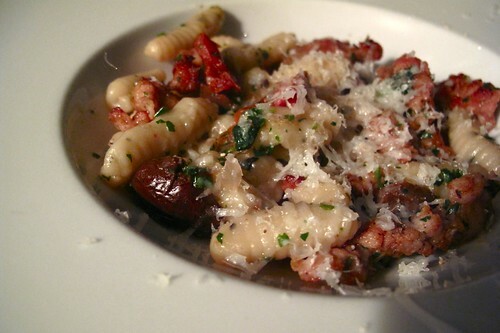 This cavatelli was tender and light--although I would've preferred for it to be a little more al dente--and the savory rabbit sausage paired well with the sweet tomatoes and salty olives. The delicious clear, sauce that pooled at the bottom of the plate was amazing. It was not overly heavy as an appetizer, yet it was satisfying. I wish I had soaked it all up with a piece of bread. 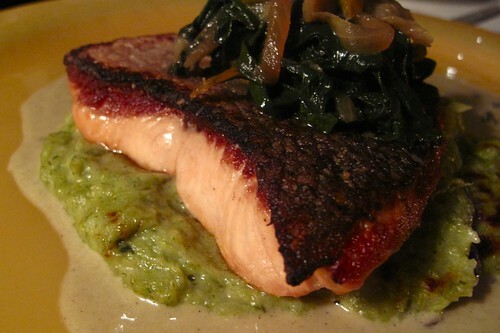 Salmon is also something that I tend to overlook on menus. However, this salmon was surprisingly good and not boring at all! The meat was so delicate and sweet and fatty. And that leek fondue! It was delicious! I'm not sure what was in it other than leeks but it was so nicely sweet and creamy. The only unspectacular part of the dish was the swiss chard--a little boring and bland. I surprised myself when I ordered the filet of beef for my entree. 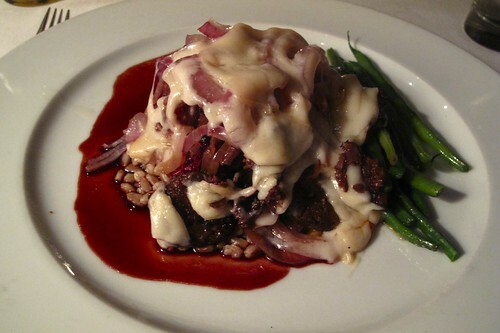 Usually I avoid beef in restaurants because I'm a little paranoid of being given a piece of overcooked meat. I was completely set on ordering the scallop entree with risotto but at the last minute, I decided I felt like having a piece of red meat! I'm so glad I made that decision. I ordered medium rare and the filet came out at the perfect temperature--beautifully pink and juicy. The haricot vert was tender while remaining crisp. 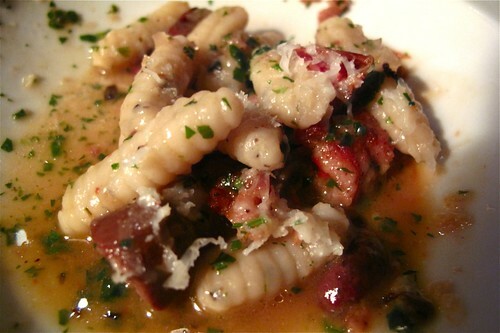 The little bites of morcilla sausage along with the cheese added nice punches of flavor to the dish. 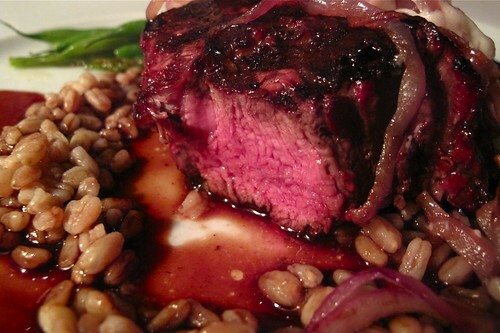 I also loved how the chewy farro soaked up the delicious red wine sauce. Probably one of the best beef dishes I've ordered at a restaurant. I loved the toffee/carmelized flavor of this dessert. It reminded me of a sort of bread pudding, but with an interesting texture that is light and sticky at the same time. Delicious...and who doesnt love hazelnut gelato? I wish we had a bigger scoop of it. 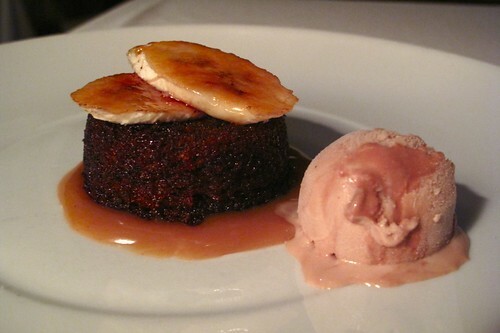 And as always, bruleed bananas are a nice touch--easy to pull off but delicious to the unsuspecting! Grace is known for their donuts so I knew we HAD to try some. Pretty much every table around us ordered the toffee pudding and the donut flight as their desserts. We liked the salted caramel donut the best. They were all nice and warm and fresh--without the gross after-taste that comes with some fried food--but in the end, they were still just donuts. 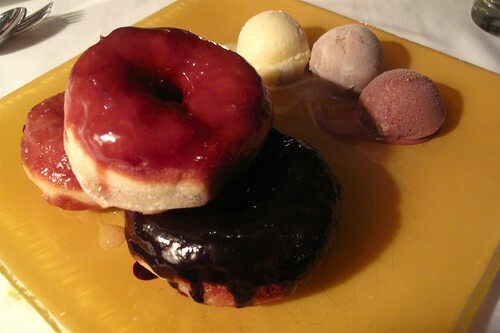 I'm not usually a fan of donuts and these didn't really succeed in converting me. However, the walnut ice cream was very interesting. 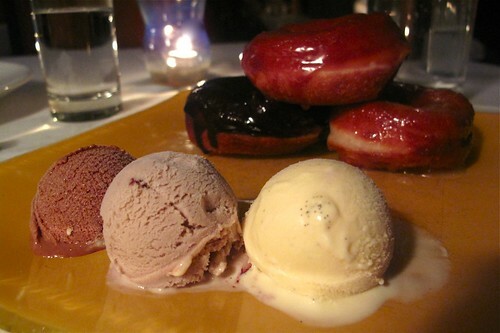 Grace was without a doubt the best meal I had during all of DineLA restaurant week. Everything was great--from the atmosphere and service to the oh-so-delicious food! Thanks for the comment! Your blog is great! what type of camera do you use? Your pictures look soo good. I've yet to have a bad meal at Grace. It's solid. I'm glad you enjoyed your dinner! @Jon: Thanks! I have a Canon G10...kind of a hybrid between a point and shoot and a dslr. Its great because it takes nice pictures yet is still very portable! @weezermonkey: I made the decision to go to Grace partly because of your reviews :) and I'm so glad i went! mmm! looks good. grace has been on my to-do list for awhile! i'm so bummed that i didn't have time to do dineLA while i was actually in LA (i think i found out about it on the day before i was leaving!) next time!